Advertise your job and get qualified responses the same day. Monster's Job Posting solutions are fast and easy! We'll give you the tools to connect with qualified candidates immediately. Connect with 17.9 million candidates who use Monster to search for jobs at least once per month1. Plus our newspaper partners can put you in touch with 17 million readers2 and 40 million unique website vistors3 each month. Choose 30 or 60 day postings. Purchase a job posting and publish instantly or save by buying multiple job postings. Manage, screen and contact your candidates directly from Monster. Posting a job is easy. Enter a job title, location and description. Need help with your description? Use one of Monster’s sample job descriptions that can be customized to your specific job. See what your job posting will look like when candidates click on your ad. Make your job posting stand out with Job Bolding, Video Profile and Enhanced Job Branding. Reach job seekers across the web with Career Ad Network® and Monster Diversity. Review your order at checkout. 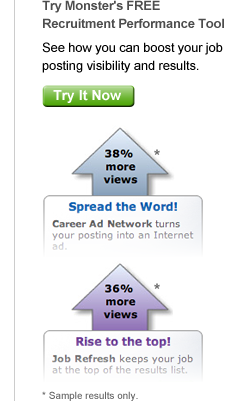 After you've posted your job, find out how many job seekers viewed and applied for the job from your Monster home page. Review our Monster Quick Guides. Register for an instuctor-led training session. This was the first time that Linnea Garvey, Director of Information at Plymouth Nursery, was using Monster. "I had a position to fill and decided to try Monster." "Not that comfortable with purchasing on the Intranet, the sales representative from Monster was very patient and jumped right in to help me. We got tons of responses to our job ad, from Florida to the East, from Indiana to Ohio. We hired a perfect match from one of the first responses we received. Depending on the position we have open, I would definitely use Monster again." Learn more in this free August 19th webinar.